Cooler temperatures have arrived after a sweltering summer. But before you know it, Southern Maryland will go from cool to cold! 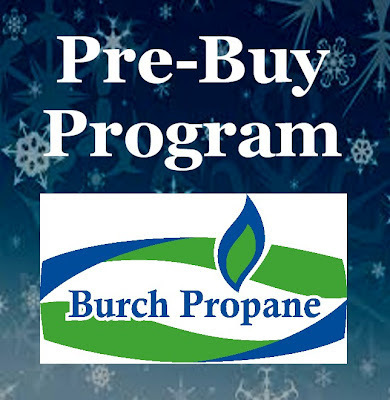 Burch Propane is pleased to announce our Pre-Buy Program, which will save you money during the upcoming winter season. From today through October 15, 2012, the Burch Propane Pre-Buy Program price is locked in at $2.599 per gallon. The great news is that this price will not fluctuate, regardless of the number of gallons purchased. to set up your Pre-Buy Program Account. Today IS a great day to be a Burch Customer! This offer is valid until October15, 2012. Requires a MINIMUM PURCHASE of 400 gallons. Payment must be made in full by November 15, 2012. The normal Regulatory Fee and Fuel Surcharge will be charged at the time of each delivery. You will not be required to pay this upfront; they will be billed to your account after each delivery. *No refund checks will be issued. *All Pre-Buy gallons must be delivered by April 30, 2013. All deliveries made after April 30, 2013 will be billed at the then current posted price-not at the pre-buy price.